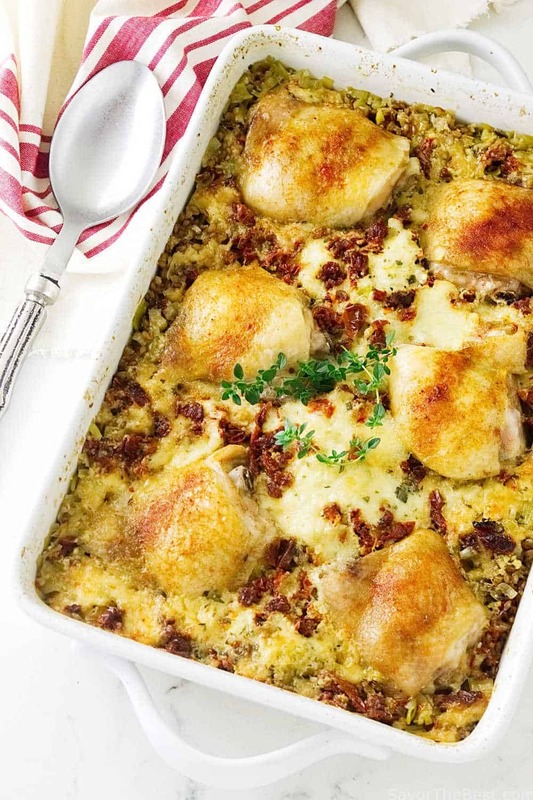 Farro Chicken Bake is a great weeknight dinner that will satisfy the most ravenous appetite. This one-pot casserole will get rave reviews for it’s deliciousness and the distinctive nutty, earthy flavor of the farro grain. Have you noticed lately that farro has been appearing on the menus in even the fanciest restaurants? This ancient grain is making a come-back to our modern times. Farro is a term that describes three different species of wheat: einkorn, emmer and spelt. They are the most primitive types of wheat that have a tough hull or husk covering them. Their outer layer requires extra milling and pounding to remove the grain, making them more tedious and time-consuming to process. Einkorn is the most primitive of the group and dates back to biblical times. All of these grains are more healthy than our modern-day wheat. Farro is a heart-healthy grain that is very high in nutritional value. 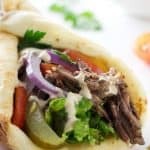 It has a high protein content, low-fat and fiber-rich. 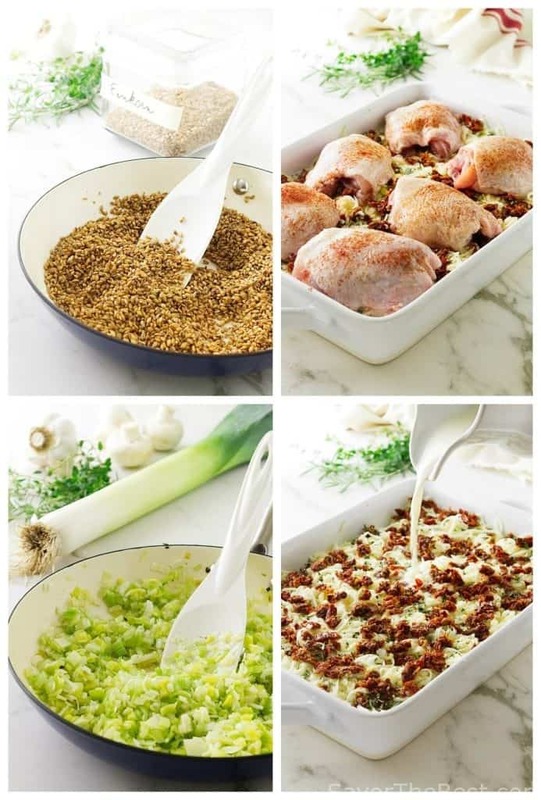 If you have been including more healthy grains to your diet and have not tried farro yet, this recipe for Farro Chicken Bake will not disappoint. Cooked farro berries are firmer than rice and have a slightly chewy texture and nutty, earthy flavor. This farro chicken bake recipe is a hearty one-dish meal that is brimming with flavor from the farro berries, veggies and chicken thighs. 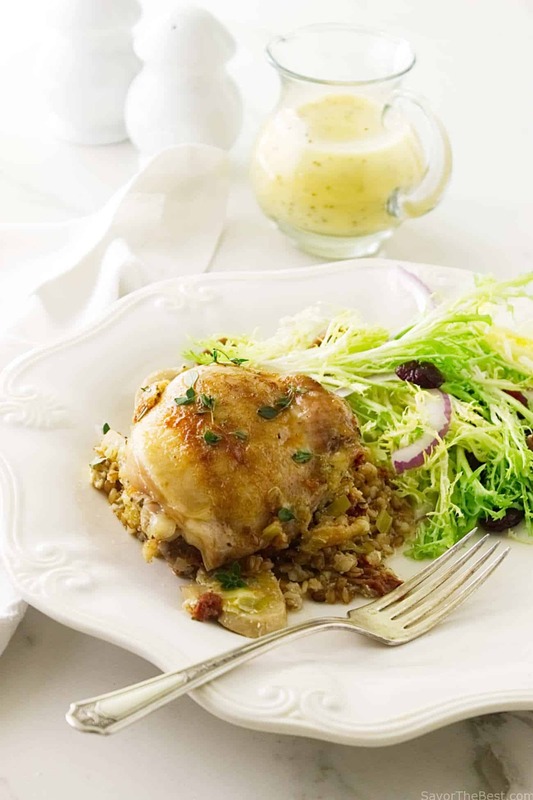 Farro chicken bake is made by first toasting the farro grain in a little olive oil. Interestingly, as the grains toast they begin to pop and crackle a bit. The toasting brings out the nutty flavor of the grain. 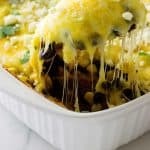 The toasted grain is added to the bottom of a casserole dish, then layered with thick slices of mushrooms. The mild-flavored sliced leeks and garlic were lightly sautéed, then added to the casserole dish. The sun-dried tomatoes add color as well as flavor to the casserole. Oil-packed sun-dried tomatoes are softer than dry-packed tomatoes. They also add a nice pop of color to the dish, however, that oil is fat-loaded. First, we drained them in a fine-mesh strainer. Next, we rinsed them with warm water and blotted them dry with paper towels before adding to the casserole. Chicken broth and sour cream was whisked together and poured over the casserole. 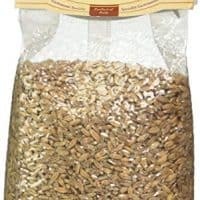 This provides a good flavor base for the farro to absorb. Finally, place the chicken thighs on top and season with salt and pepper. After dusting the chicken with paprika the casserole bakes for about forty-five minutes. The chicken thighs are tender and juicy. 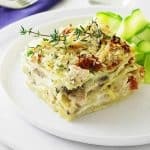 As the chicken cooks on top the juices drip through the casserole adding a yummy goodness to this awesome tasting casserole. This is a healthy, all-in-one dinner, just make a light salad while the dish is cooking. 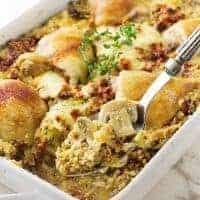 Farro Chicken Bake is a one-pot casserole that will get rave reviews for it's deliciousness and the distinctive nutty, earthy flavor of the farro grain. Add the oil to a large pot set over medium heat and when it is hot add the farro berries, stirring to coat with the oil. Cook the farro, stirring frequently until they become toasty. You will hear them pop and crackle as they toast. Pour 6 cups of water over the farro and bring to a boil. Cook the farro until it al-dente or still has a little bite. It should take 15 to 30 minutes depending on the type of farro you have. Drain the farro and transfer it to the prepared casserole dish, spreading evenly across the bottom of the dish. Add the sliced mushrooms on top of the toasted farro in an even layer. To the same skillet, add the sliced leeks and the garlic and cook until the leeks become wilted and the garlic is fragrant. Transfer to the casserole and spread evenly on top of the mushrooms. Distribute the drained sun-dried tomatoes over the leeks. In a dish or pitcher, whisk the chicken broth and sour cream together and pour over the casserole. Sprinkle the shredded cheese over the top and add the chicken thigh, skin side up. Season with salt and pepper and dust lightly with paprika. 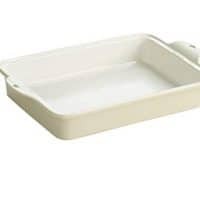 Transfer the baking dish to the middle rack of the oven and bake for 45-50 minutes until the chicken thighs reach an internal temperature of 165°F. Remove from the oven and serve immediately. I used uncooked farro and toasted that and baked the casserole at 375 for 45 min. The farro didnot absorb the chicken broth sauce as I thought it would. the farro was hard but nutty flavored. The instructions did not say to cook the farro before toasting it. Did I do something wrong? Hi, Ruth…Thank you for your feedback. 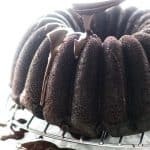 No, you did not do anything wrong when you made this recipe. Some packages of farro needs a little more baking time to soften. Cooking another 5 minutes should work. I will put a note in the recipe to check the farro for doneness. Thanks again for your comments. Have you made it with chicken breasts? If so, what the the cooking time? Hi, Stephanie….thanks for that great question! No, I have not used chicken breasts in this recipe but it would definitely be delicious. Since chicken breasts would cook faster than the thighs they would be over-cooked if they baked at the same time as the thighs in the recipe. How I would do this is to prepare the casserole as instructed but not add the chicken breasts. 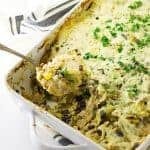 Bake the casserole for 15 minutes, remove the dish from the oven and add the chicken breasts then bake the casserole for the remaining 30 minutes. When done the internal temp of the chicken breasts should be 165° when checked with a thermometer. I am yet to try farro, as it is ancient grain it will be good. 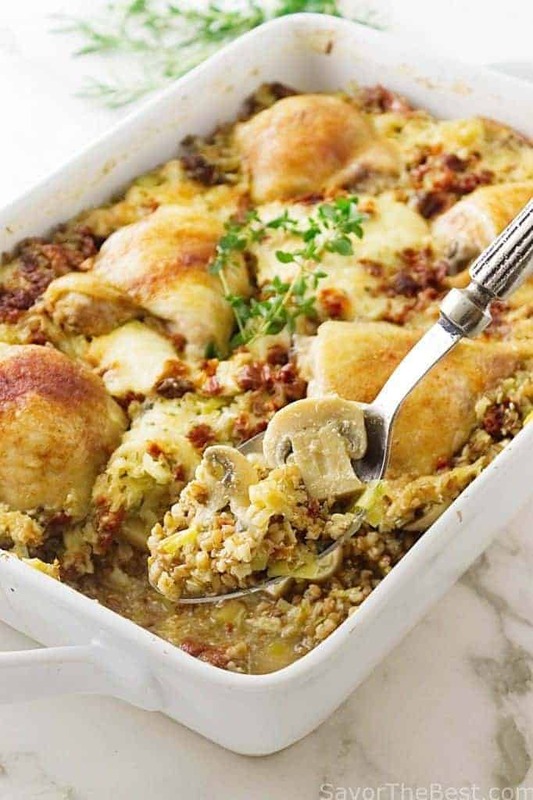 I like this flavor rich farro chicken bake delicious one pot meal and easy to put together. This looks really healthy and hearty. I love the flavors imparted from the leeks and the sun-dried tomatoes! We’ve been cooking with farro for quite a while now. We first discovered it at Costco in a large package. Ever since then our pantry has always held a supply of it. It’s such a great addition to any protein like the chicken. It absorbs the tasty juices and you only have one pan to clean up. Hi, Marisa…Farro is a great choice when you want a change from rice or potatoes. It makes a great salad too! 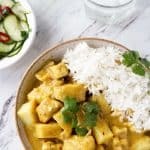 wow this sounds fantastic and I really love all on one pan meals like this one its so much easier! Thanks, Claudia…This is a great recipe and can also be put together a little in advance, then baked. I love farro and so does my family! we have been enjoying it for a long time. 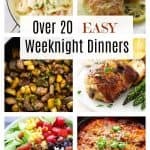 I love your farro chicken bake, it has everything to make an amazing meal! Love how hearty and filling this looks. And you made it look so easy to make! Michelle, it is pretty easy! I like easy 🙂 Thanks for our nice comments. I never miss an opportunity to eat something with farro in it! I love how it tastes, and the texture is just incredible. What a great family meal!